Use the 6V6035 Hardness Tester to check crankshaft journal hardness before and after they are reground. It is important to check for hardness if the journal shows signs of high heat or if it has been ground to a new diameter. Do not use any other method to check for hardness. 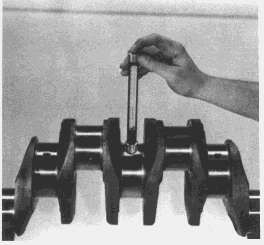 This can result in damage to the crankshaft. The 6V6035 Hardness Tester has a hardened steel ball which “bounces” (hits) off the tested surface. The height of the bounce is read as a Rockwell “C” scale hardness reading. Crankshaft journal hardness tolerances are given in “Crankshaft Measurement Specifications” in the Guideline for Reusable Parts, Form SEBF8041-01, Crankshaft Measurement. 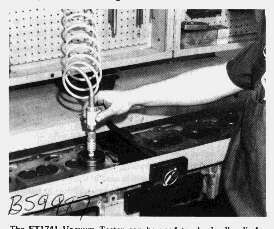 The 6V6035 Hardness Tester can be used on any Caterpillar crankshaft if the journal diameter is at least 38 mm (1.5″), and is smooth. The journal must be polished and have no smeared bearing material on it. To use the 6V3035 Hardness Tester, the surface finish must be .8 micrometers (20 microinches) or smoother and have a minimum surface thickness of 25 mm (one inch). The 6V6035 Hardness Tester can be used to test most crankshafts for hardness.